We have some unfinished business to attend to today. 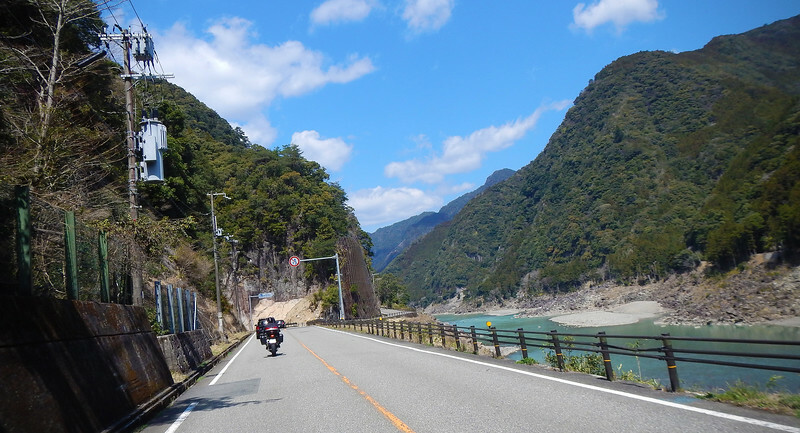 Kumano Nachi is very close to where we are staying in Nachikatsuura, just less than 15 minutes ride back into the interior of the peninsula. 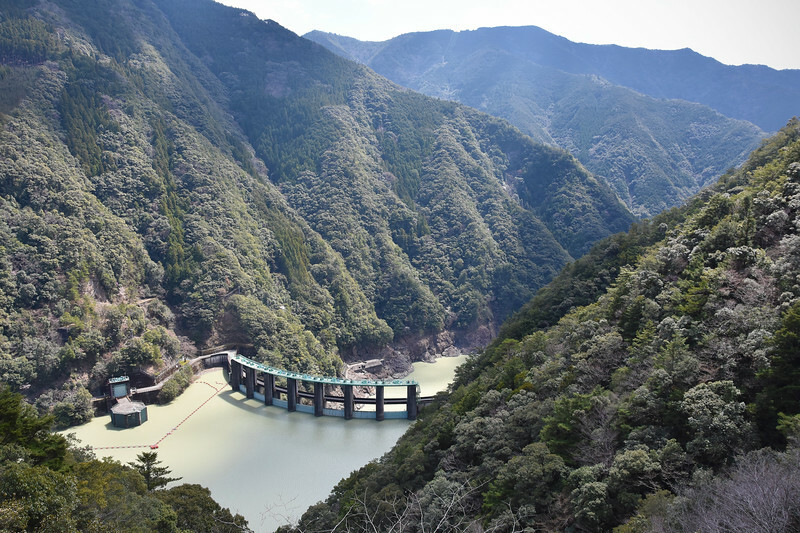 All the names in this area are a derivitive of Nachi, possibly after Mount Nachi: Nachi River, Nachi Katsuura, Kumano Nachi. 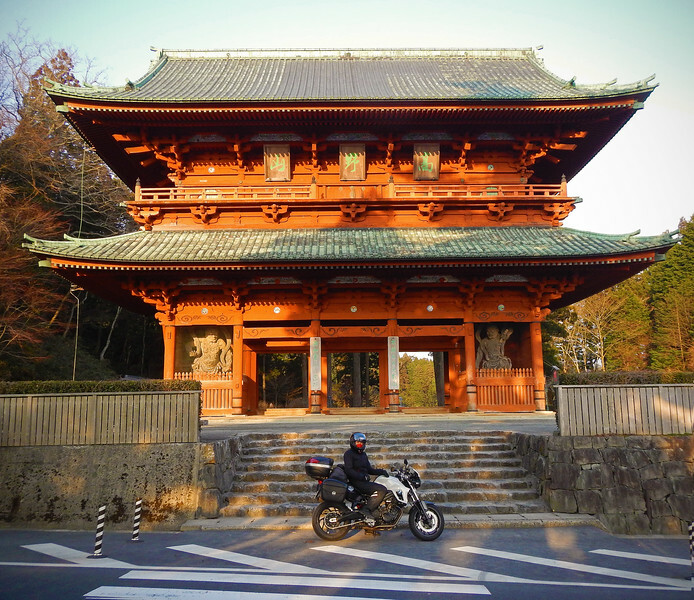 Toriis are found at the entrance of all Shinto temples. 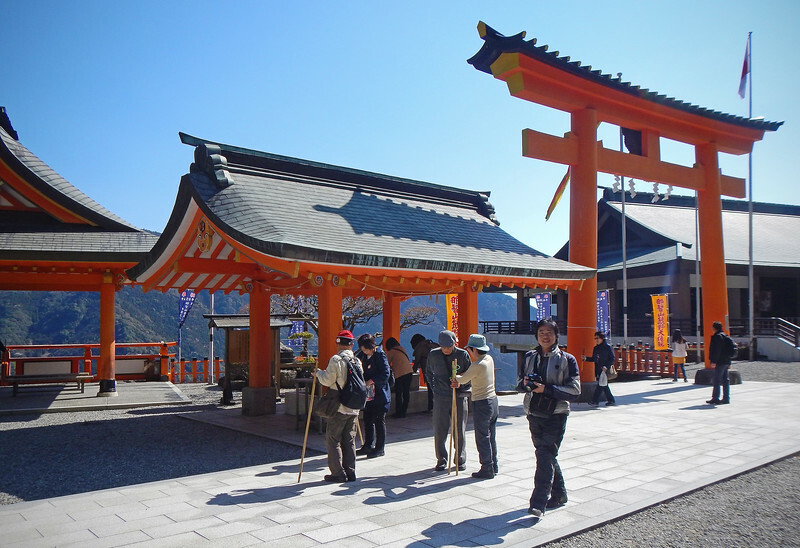 Walking under a Torii is supposed to signify crossing into a sacred, magical place. 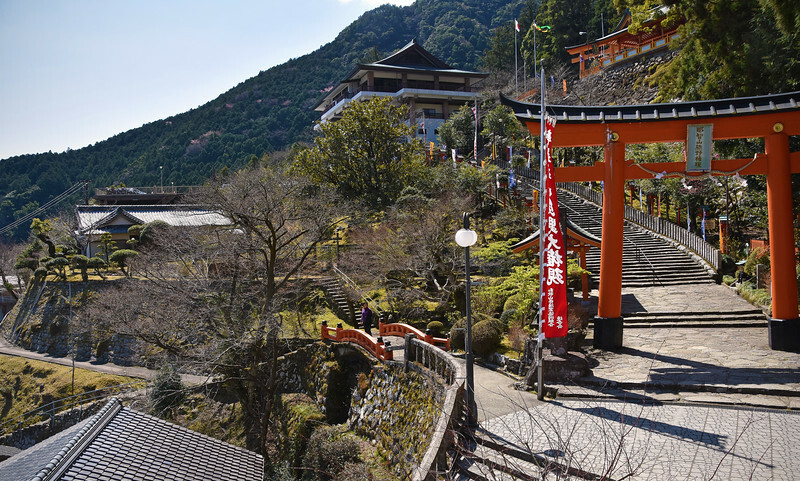 This reddish-orange is a very popular colour for Torii, and the paint is made from a mineral-based pigment called Vermilion. The colour is said to be able to ward off evil spirits. First wash the left hand, then the right, then rinse the mouth, in that order. The Japanese culture is so etiquette-oriented, it's not enough to perform a task, there's a right way to do it and a wrong way. The Shinto Shrine Maidens (that would be a cool name for a heavy metal band), dressed in white kimono jackets (haori) and red, pleated skirts (hakama) are involved with the daily running of the temple. They sweep up around the temples, perform cleansing rituals and sit at reception counters, selling incense, ema and other religious trinkets to visitors. It's a popular part-time job for many Japanese girls and doesn't require any sacred vows that the priests and monks have to undertake. Mikos have been featured prominently in a lot of recent animes and have sparked interest in foreigners who are enamoured with Japanese culture. 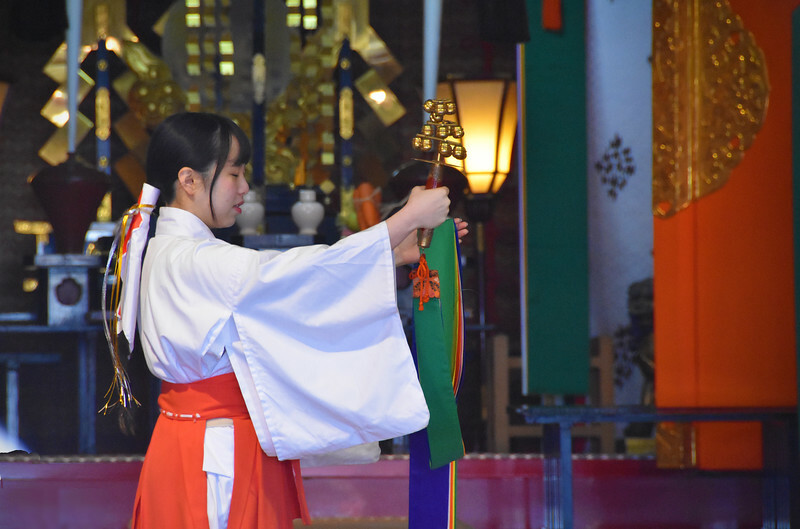 So much so, that there are now miko-for-a-day programs run at some temples, where you can learn what a Shinto Shrine Maiden does, get dressed up in the haori and hakama, and perform the kagura-mai ceremony yourself! Girls only, though! 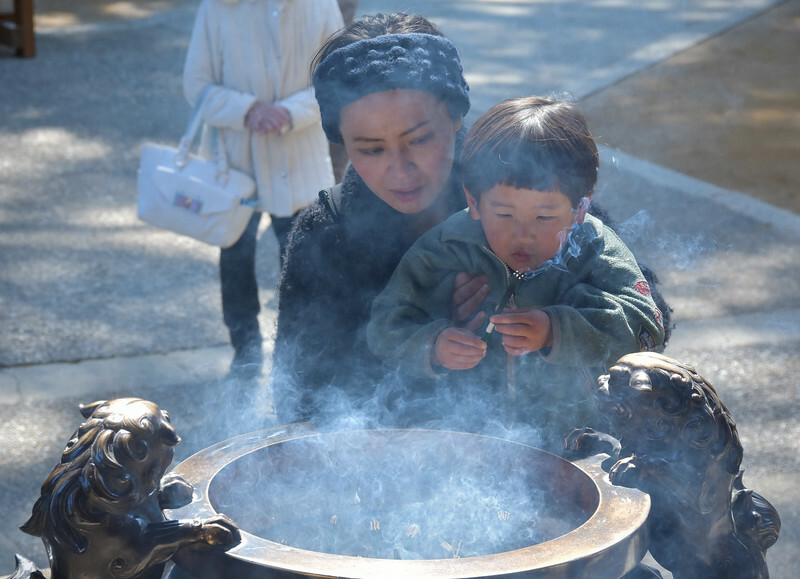 Like all things Japanese, there is a specific ritual that needs to be observed when burning incense. You light the incense, wait a few seconds, then extinguish the flame using your hands. It's considered improper to blow it out with your mouth. Every Japanese kid learns all the rules for how to be a proper nihonjin very early on. The ritual for praying goes like this: first, throw money into the offering box. Then tug on the rope to ring the huge bell above. This calls the diety's attention. Then bow twice, make your wish or prayer, clap your hands twice and then bow once again before leaving. So interesting watching all the Japanese visitors do this! Clapping the hands also calls the god's attention, but also wards off evil spirits. 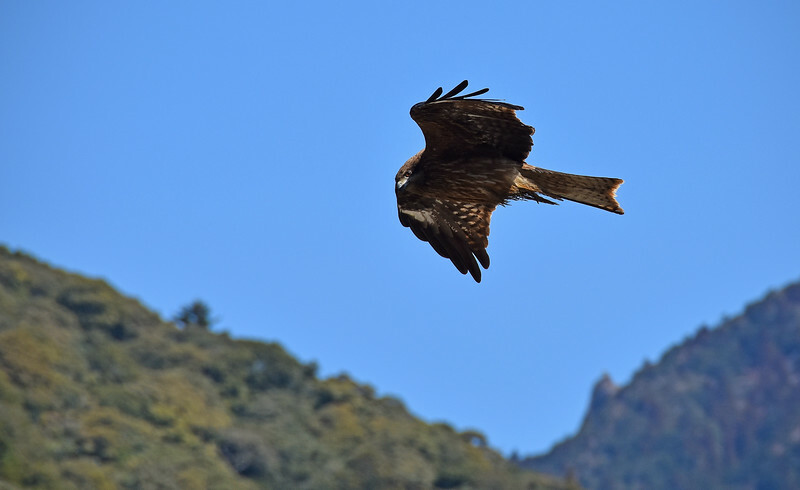 For years, the German falcons were in competition with the Japanese falcons to see who could be the fastest. Fears of a backlash due to safety concerns forced the falcons to come to an informal agreement to limit their top speed to 300 km/h, but right before this agreement was put into place, the Japanese falcon topped 312 km/h, securing its place in history as the fastest production falcon ever. The Laughing Buddha, or Hotei as he is known in Japan, is actually not related to the religious Buddha. In most Asian mythologies, the Laughing Buddha was a monk who carried around a sack that is either filled with candy or gold - depending on whether you're telling the story to a child or not, I guess. 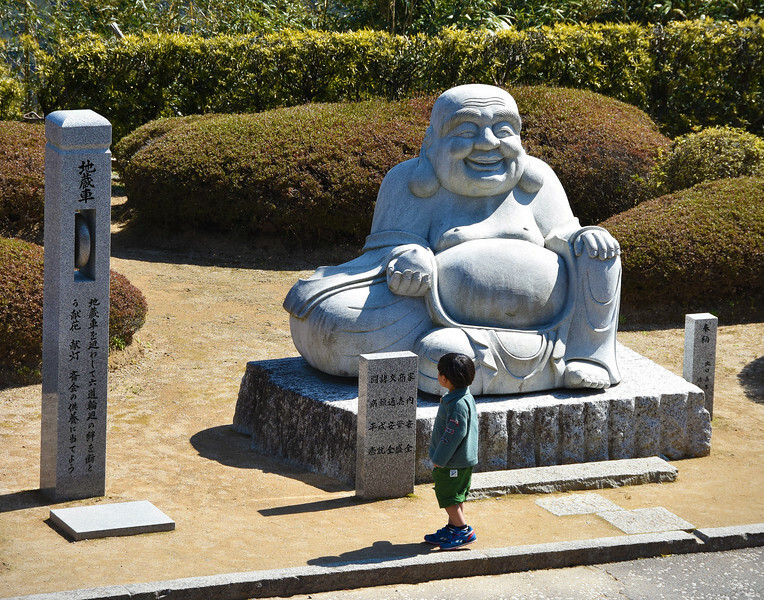 The word for monk "budai" is very similar to "buddha", so he's nicknamed The Laughing Buddha. He symbolizes wealth, contentment and cavities. The Seiganto-ji temple ia three story pagoda and is very popular with visitors. There's a waterfall in the background (named Nachi Falls - nachirally!) which makes it a favorite shot for photographers to frame the pagoda. In a couple of weeks' time, the bare Cherry Blossom tree in front will bloom and provide a nice pale pink contrast to the orange-coloured temple. Our quest for Neda's Cherry Blossoms continue. Still too early and cold. Gotta head further south! 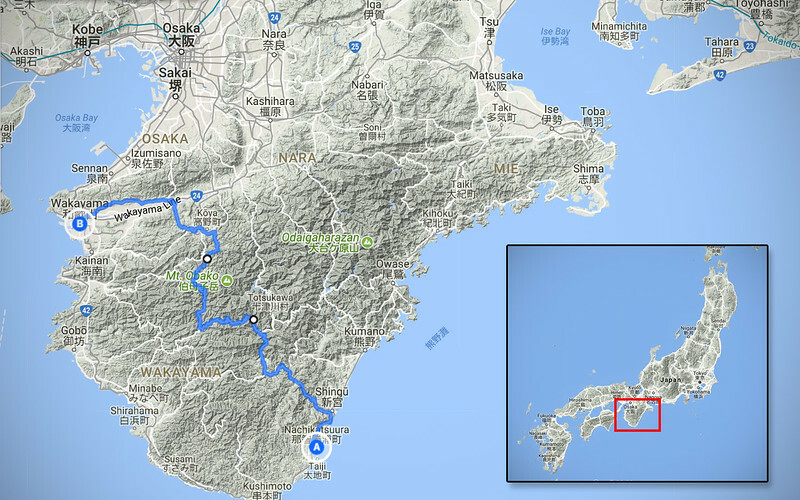 We have actually now crossed over to the next prefecture, Wakayama, which is situated mostly on the western side of the peninsula. We are taking a bit of a detour around Road 425, the narrow, nasty broken pavement path that we got stuck on the day before. I just found out the Japanese call these kinds of roads 酷道 - Hidoi - or literally translated "Cruel Road". Haha! 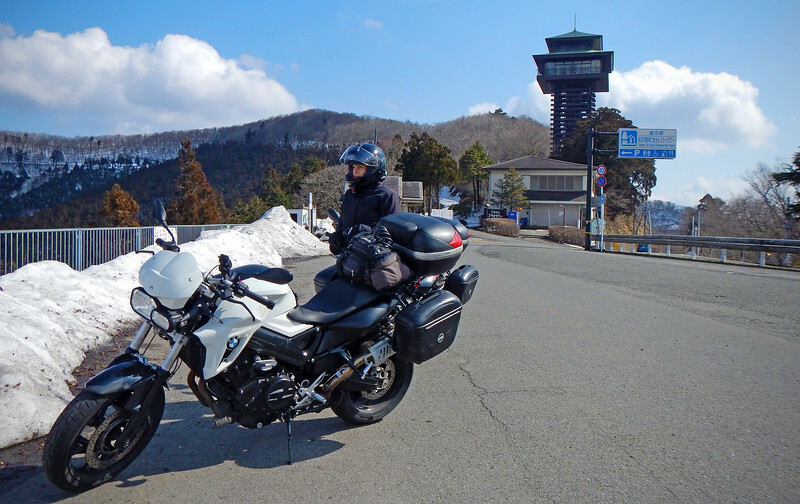 Our detour on the much wider and more well-paved 169 is more suited to our kind of motorcycle. 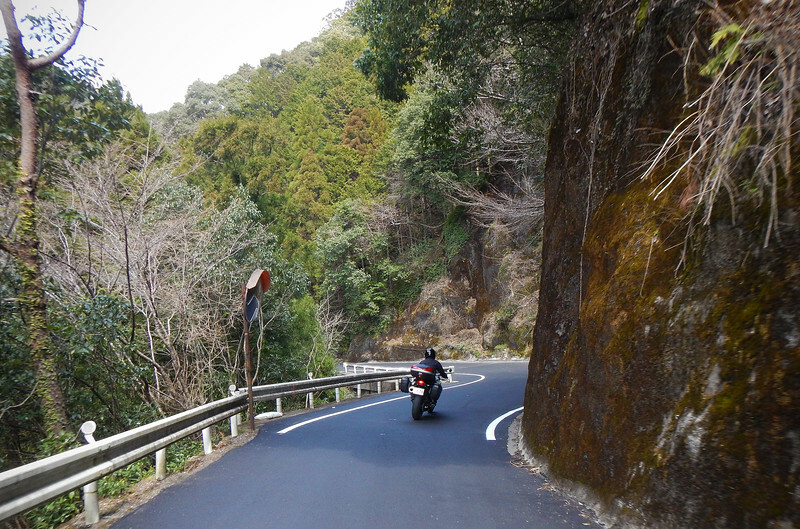 It doesn't get much warmer as the twisty road winds its way down the valley and then back up to Mount Koya. We're in the town of Koya because we heard there was a nice temple here. We ride past a pathway leading into a very old-looking cedar forest. Is that a noodle bowl on his head? We figure there must be food nearby, and our hunch pays off! Thankfully the vending machine that you buy your meal ticket from has pictures, so we order a couple of ramen bowls without any linguistic difficulties. This is one of the drawbacks to Japanese culture. Because they are so etiquette-centric, you don't know what rules you are breaking just by simply walking down the street, entering a temple, burning an incense stick, or even eating... There's a lot of peer-pressure in this society to follow these rules, and if you break them, you face immense judgment and social ostracism. This humiliation or "loss of face" is the worst thing in Japanese society! Although I find the Japanese way of doing things fascinating, I can't help but feel a bit self-conscious all the time here - it's a continual sense of "What am I doing wrong now?". Often we find out about these rules of etiquette *AFTER* we've broken all of them! We're constantly observing how everyone around us does things to make sure we're not committing any egregious faux-pas! 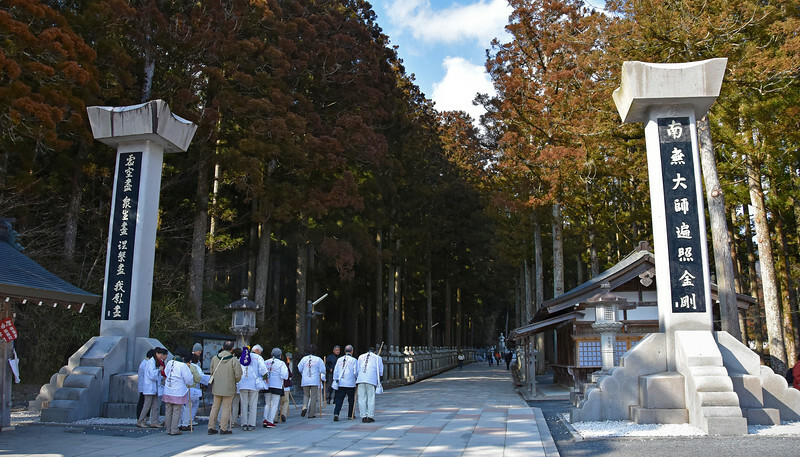 Kongobu-ji temple is a Buddhist temple, but of the Shingon Buddhism sect, which also worships dieties found in nature, just like Shinto. It's the closest Buddhist sect to Shinto-ism. 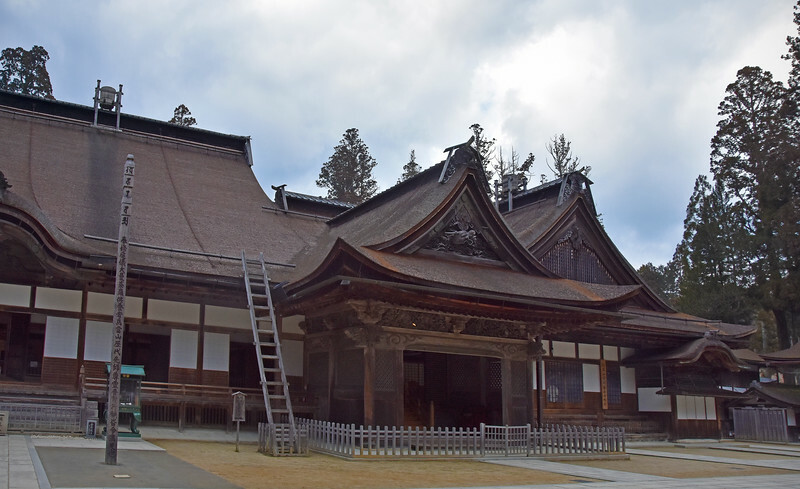 The architecture here is slightly different from the Kumano Shrines. Even off the bikes, walking around the temples up here in Koya, it's freezing. Neda says I look like a ninja! It's getting very late in the afternoon and we're about an hour away from Wakayama, where we are meeting Michael's friend that we're staying with. We definitely don't want to be riding after sunset, especially up here in the mountains. We'll get hypothermia for sure! 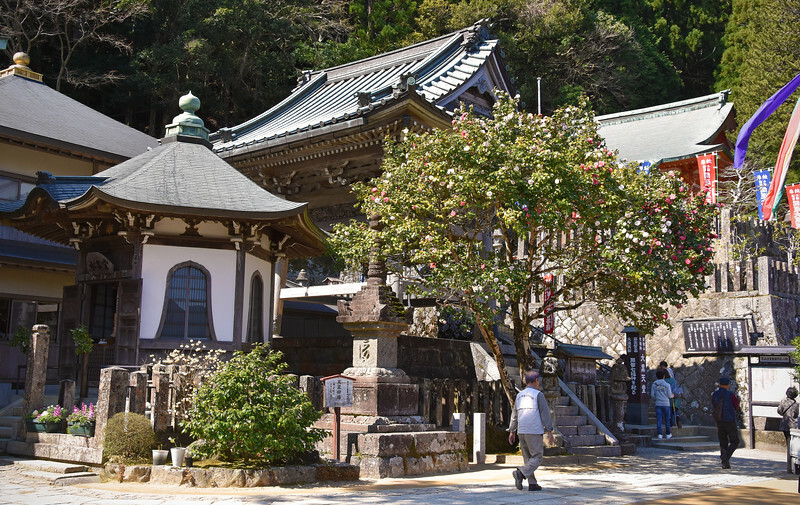 From Koya, it's just a single road that leads us back down the mountains to the big city of Wakayama. Because of the traffic, we arrive much later than we had anticipated and Warren has to find us in the dark after we call him up. Warren pulls up in a scooter and after some brief introductions (making sure that Michael hasn't referred a couple of axe murderers to him), he leads us back to his house. 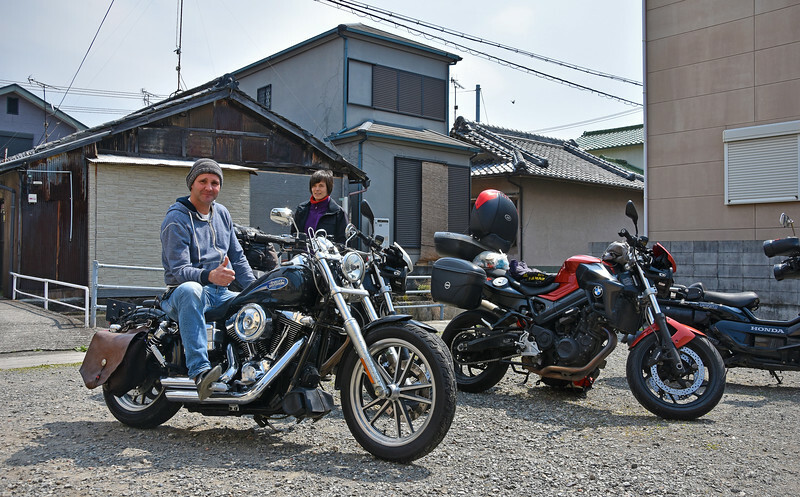 After settling in, we hop back on the bikes and ride a few streets away to Warren's favorite izakaya where he treats us to dinner and beer as we talk about our trip. In turn, we quiz him on what it's like living in Japan. He's an ex-pat from Australia and he works in a local high school. "Oh, are you a teacher?" I ask. "No, I just hang around the school talking to students." Huh? That's an actual job? Warren proceeds to tell us about the ALT position in schools. ALT stands for Assistant Language Teacher. As an ALT, you don't actually teach lessons officially (although some ALTs do it), but you are what's known as a cultural and language ambassador. Basically, an ALTs presence in a school is meant to make the students feel more comfortable around gaijin, so they can practice their English and prepare them for dealing with foreigners if their future professions call for it. How interesting! And it's an actual paid position! 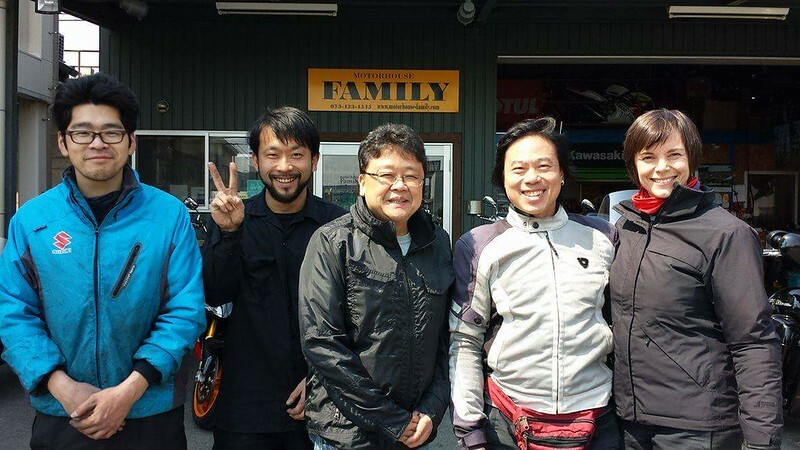 I wonder if there's a Japanese job that pays you to ride around the country. 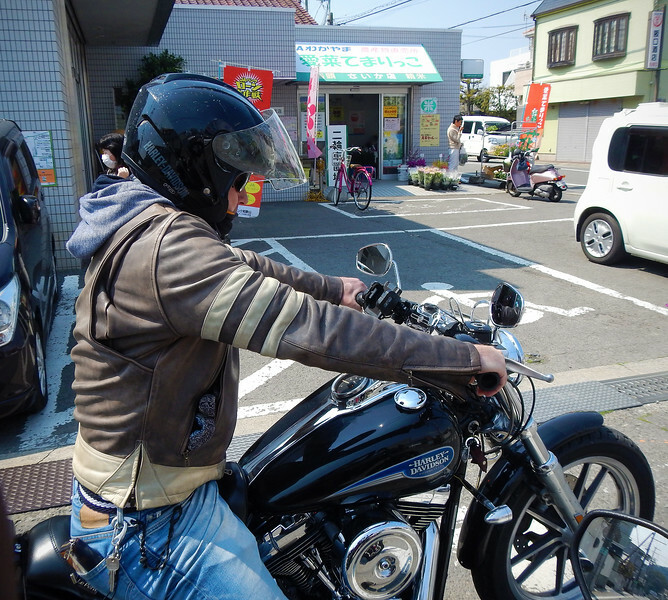 So Japanese motorists feel more comfortable with crazy western motorcyclists not accustomed to riding on the left hand side...? I would settle for just free tanks of Haiku-Ramen-Gasorin. Speaking of ramen, in the morning, Warren makes us his favorite breakfast dish - Nabe! Nabe means "hot pot" and is short for Nabe-mono (mono from the English word for one or single), so it means throwing everything in one hot pot. It's a popular dish in the winter months because the stew or soup is kept hot on a burner throughout the meal, as everyone gathers around it to eat. It's a very Japanese social tradition. Very cool to experience these little things. I like that Warren has adopted all of these local customs and practices. I think if we ever lived here, we would do exactly the same thing. 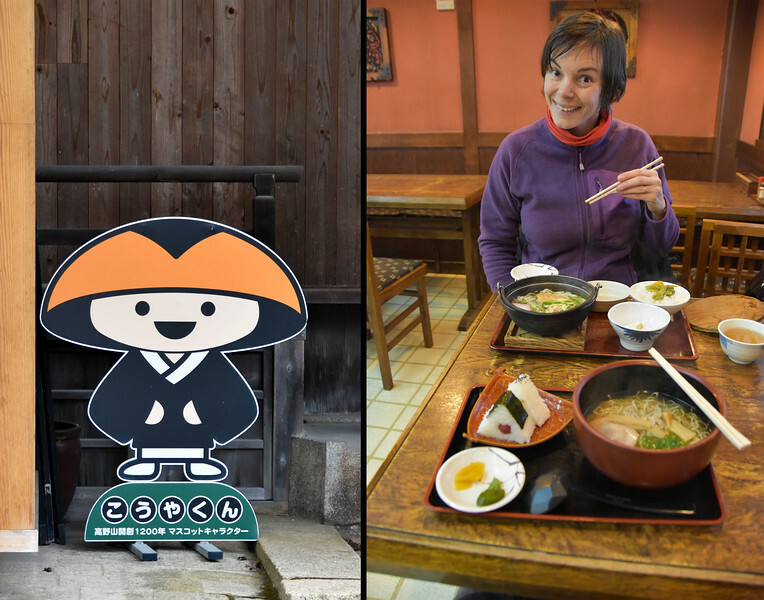 Neda really likes the citrus Ponzu sauce that goes with Nabe. Also lots of vegetables in the broth, so Nabe with Ponzu is now Neda's favorite breakfast dish too! He explains to them how we're riding around the world on motorcycles. I feel like such a celebrity!